How to install the chrome extension. The default tab in the Chrome Extension is the ‘Connect’ menu. When used alongside Gmail in a Chrome browser, the context-aware “Connect” tab is activated. When used in any other browser tab the “Connect” tab will show a default “This feature is not available outside of your Gmail inbox” message. If used with Gmail: When Connect is context-aware it provides shortcuts to actions you can take in relation to the contact that sent the email you are currently viewing. Quickly look up information on the email sender, or schedule a meeting with them in seconds. 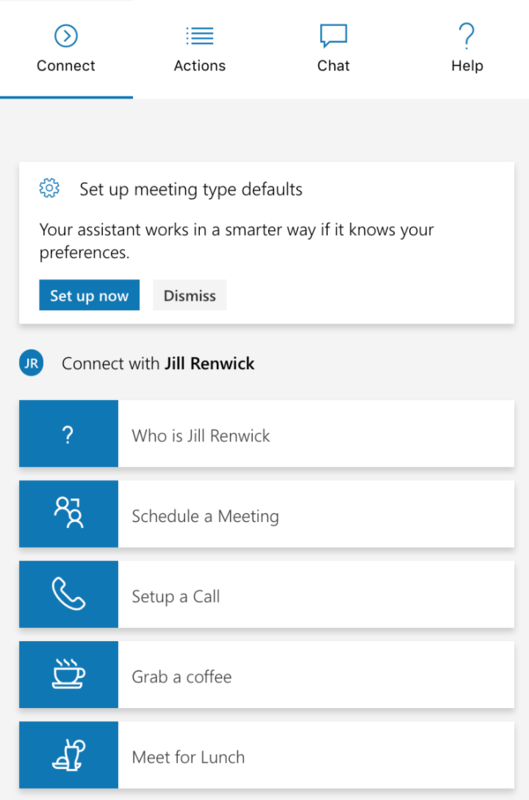 The Connect menu makes it easy to look up information on the email sender or schedule a specific meeting with them in seconds. The Actions tab gives you shortcuts for actions you can take related to other contacts or tasks that do not require a contact. This makes it easy to initiate a request for frequent tasks like asking when you are free or initiating a meeting (with those other than just the email sender). When am I free in the next 7 days? The Chat tab is where you talk to your assistant. You can do everything that you can do in a normal in-chat assistant experience. Pretty awesome eh?! All the shortcuts from the first two tabs redirect you here and start the request for you. Notifications: The Outlook Plugin can NOT receive in-chat notifications (e.g. Morning Briefing, Upcoming Meetings, etc) so instead these will be sent by email. The Help tab provides easy access to frequently asked questions and product education. It’s a great place for you to learn how to ask your assistant to complete a common task.